Married couple Allison and Jeff’s journey across the Atlantic turned into a celebration last week when the couple reached significant Million Mile achievements together. Jeff logged his millionth mile as his wife lapped 2 million miles traveled with Delta between Minneapolis-St. Paul and Amsterdam. Headed ultimately to Barcelona, the couple hadn’t been keeping track of their miles and were unaware it was a special occasion. “We had no idea this was happening today, and let alone on the same flight,” Allison said. The Minnesota couple has collectively surpassed 3 million miles largely through service-based trips. Allison travels overseas as a pediatric cardiologist – the purpose of the trip to Barcelona - while Jeff works as a coach, mentor and community health volunteer. Their trips often involve speaking and education, and they’ve been to Iraq, Thailand and Kenya in 2017. 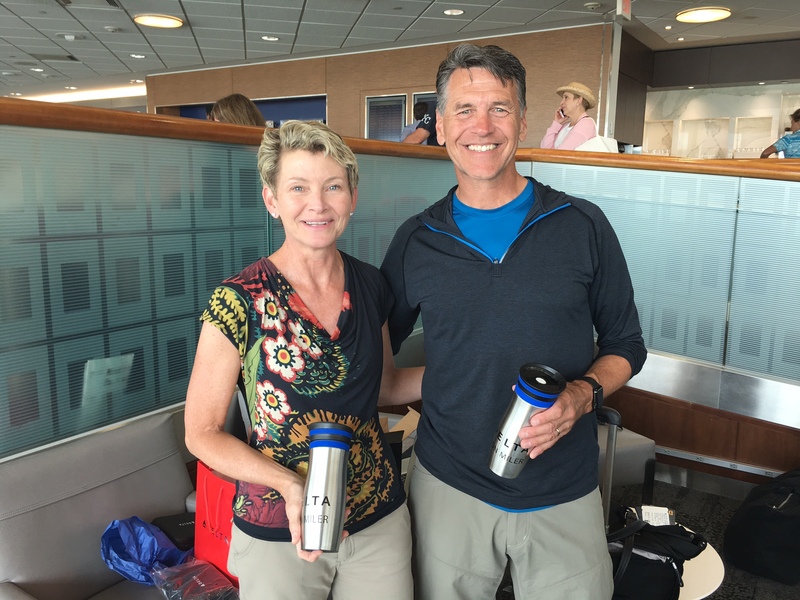 It wasn’t until the couple’s normal departure routine was interrupted at the Delta Sky Club with special gifts that they realized the trip was a significant milestone. The flight crew then dazzled the couple onboard with an onboard announcement and a red velvet cake delivered to their seats. They were then welcomed to Amsterdam with more goodie bags and a banner waiting at the gate. Eric Cortelyou, of the Airport Customer Experience team, said he wanted to do something more involved than the typical Million Miler recognition. “It’s not just a single new million miler, it’s a couple that is both reaching a new tier together on the same flight. We like to celebrate commitment like that,” he said. Upon each new tier a Million Miler reaches, they advance in complimentary annual Medallion status and receive additional benefits like unlimited complimentary upgrades. They are also rewarded with a choice of a Hartmann, Tiffany & Co. or Tumi gift. The Customer Recognition team has celebrated over 1,000 new Million Milers at more than 50 airport stations this year. “Seriously, traveling together is both a blessing and a privilege. Here’s to a million more,” Allison wrote on the couple’s shared Instagram. Cortelyou credits the care and attention for Jeff and Allison to the hard working teams at MSP and AMS, making the couple feel as if they are Delta’s only two customers in its reach of 180 million.